It has been 5 years since I started this blog, but with the new website now launched, it has all been lost into the ether, so this is a good opportunity for a “re-boot” and to re-introduce you to some of my favourite dishes from my home province of Teramo. Being the first of my secret recipes I really should have chosen something a little easier to make, but as this dish is possibly one of my all time favourites, I thought if I set the bar high, it will be a good benchmark for future dishes. I just hope that when you attempt it yourself, it will taste so good, you'll be encouraged to come back to my blog to find something easier to make next time! As with many Italian recipes, almost every region stakes it's claim as being the true origin of a particular dish; timballo is no different and there are many variations to what it contains and how it should be made, but of course I think Timballo alla Teramana is the best, but I would wouldn't I? The name of the dish is derived from the French word "timbale", meaning kettledrum and traditionally timballo of all kinds is baked in a round tin which funnily enough looks like a drum! Of course, I will never concede to accepting timballo is of French origin in spite of it's name. I choose to use a rectangular tin, as it is easier to slice into nice even portions and the presentation on the plate is much better. It takes about 3 hours to make this dish, plus another hour for cooking/cooling before serving. It really is a great way to spend an afternoon and something I have done many times with guests at La Grande Quercia Bed & Breakfast with whom I have shared some of my secrets...just some, not all! I hope you have fun making this and enjoy it as much as I do and look forward to hearing how you get on. If you would like a copy of the recipe in PDF format so you can print it off easily, please add a comment and like this post and we’ll send you one. Break all 10 eggs into a large bowl and sift in the flour and salt, whisk the mixture to combine. Add the cold water and continue to whisk until the batter is smooth. Sieve the batter into another bowl to remove any lumps. The consistency you need to get is similar to the thickness of single cream. Heat a flat non-stick pancake pan (30 or 32 cm) on the gas hob. Drizzle some oil onto the pan and then wipe clean with some kitchen paper, so as just to leave a trace. For each scrippella you will need approximately 50 to 55ml of batter. Use a ladle to pour the batter into the centre of the pan and quickly rotate to spread the batter evenly across the surface. Keeping the pan on a high heat, cook until bubbles appear (about 30 seconds). Flip over and cook this side for approximately 10 to 15 seconds. The scrippelle should remain soft and not crispy. When cooked, place on a clean tea towel and return pan to the gas hob. Repeat the above steps, placing each scrippella separately on the towel and leave until cold. You should be able to make 26 or so scrippelle. If they start to stick, add a little oil to the pan and wipe clean again. Once they are cold, you can then stack them together and wrap in the tea towel and place in the fridge. Using a large earthenware pot, place carrots, onion, celery and oil in it and sauté the ingredients on a medium heat until soft, but not browned. Now add the passata, peppercorns, and cloves, and season to taste. Bring to a boil and then lower the heat as much a possible and simmer for at least 2 and a half hours, stirring occasionally. The longer it cooks the better the taste. In a separate frying pan, fry the minced meat on a low heat until it is no longer pink. Set to one side. Now I know the traditional recipe calls for the minced meat to be made into the tiniest of meatballs called “pallottine”, which you will see used in a later secret recipe of mine for “Chitarra Teramana con le Pallottine”. However, I like making it this way, as for me it gives a more even distribution of the flavour. Firstly, grease the bottom and all sides of the tin with the butter. Next, lay 4 scrippelle separately in the bottom of the tin, with half of each scrippella overhanging the outside of the tin. These first 4 should overlap each other slightly to form the base layer. Place 2 tablespoons of the tomato sauce over the scrippelle and using a soft silicon brush or spoon, spread evenly to achieve a thin covering. Next sprinkle approximately 20g of the cooked mince over the sauce. Place about 25g of mozzarella, again evenly over the layer. Sprinkle on about 10g of parmesan cheese. Pour 1 tablespoon of the milk and egg mixture over the layer. Now for layer number 2! Take 1 scrippella and lay this over the first level. If the scrippella is too large, trim the sides so that it just fits in the tin. 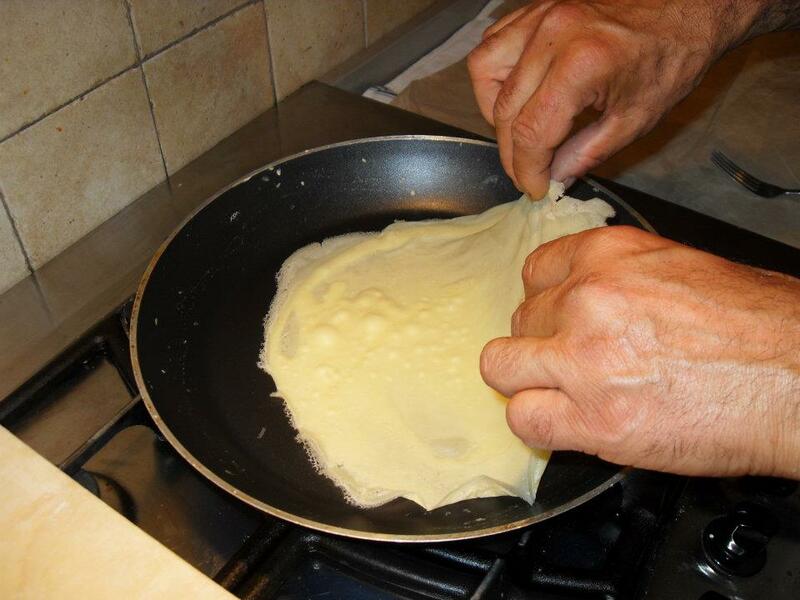 Repeat the adding of the filling and layer again, until you have made 9 layers. Add one last layer of sauce, cheese, milk and eggs and with the scrippelle that you left hanging over the sides from the first layer, take each one and fold back over the top to close. Place 4 or 5 knobs of butter evenly on the top and cover with aluminium foil. 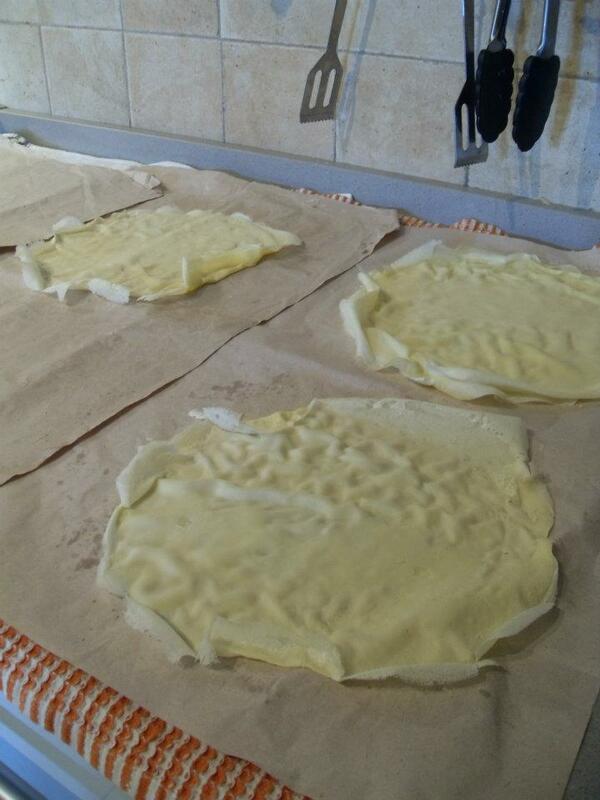 Pre-heat oven to 190c and place in the oven for 40 to 45 minutes, removing the foil after 10 to 12 minutes. You need to achieve a light to medium brown colour with a slightly crispy top, which should have risen into a dome. Remove from oven and leave to cool for about 10 minutes or so before serving. Don't worry when the top sinks down as this is normal. Cut into 8 portions and serve. 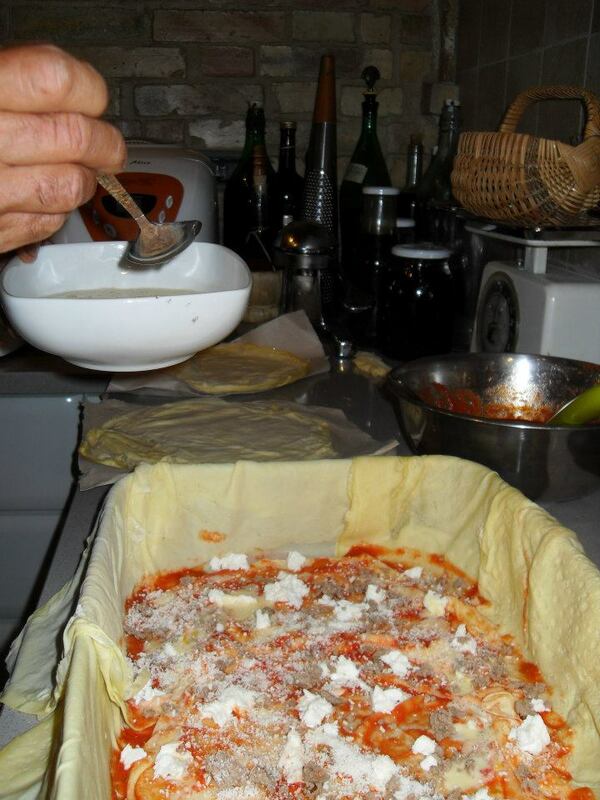 The timballo should be firm and each slice should stay together without running everywhere. If it does, leave it to cool down a little longer.